The Tour Edge Lady Edge starter set features a high-lofted 460cc driver designed for superior distance and accuracy, a low-profile stainless steel fairway wood with a super low center of gravity for higher flying wood shots, and an easy-to-hit stainless steel hybrid for maximum forgiveness on the long iron shots. Oversized stainless steel irons incorporate an undercut cavity design for higher, longer, more forgiving iron shots from anywhere on the face. The high-MOI mallet-style putter and lightweight stand bag elevates your game. 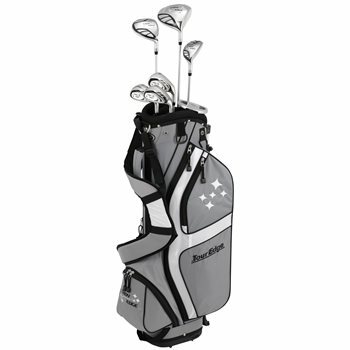 This set includes: Driver, 3W, 6H, 8 iron, PW, SW, putter, and lightweight stand bag.